Thank you for my recent reminder to renew my membership. Unfortunately I no longer wish to be associated with the IoP. My concern goes back to March this year when I contacted the Institute regarding their evidence submission to a House of Commons Science and Technology Committee investigation into the work of the Climatic Research Unit at the University of East Anglia. The response from the IoP to my concern about this evidence submission was also well below what I expected. The only specific response [which I can’t find on the IoP website now but is reproduced at the bottom of my letter from March 2010 here] was an anonymous note from a member of the board that issued the submission saying that we should be “relaxed” about the process by which the statement was written (despite the fact that “working scientists just don’t have time to [produce the first draft of the statement]”. If any other responses were issued I suspect I missed them as I had no further communication from the Institute. The anonymous statement, and refusal to disclose who had actually written the submission, was particularly ironic as the evidence statement was calling for greater openness from the scientists it was criticising! Furthermore, IoP journals do not even require the level of data “openness” that the submission criticised CRU for not following. In the end, the HoC S&TC report was very supportive of the CRU so at least your evidence submission had no impact in that respect. However, the IoP still set a precedent that it is willing to openly criticise the work of scientists without providing any evidence to warrant such an attack. 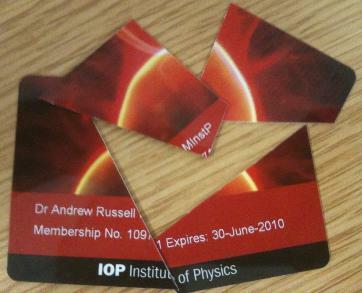 I am sad to leave the IoP as I have been inspired by some of your work and recognise what you do to promote physics. However, following this episode, I can no longer support the Institute.